The journalist Fayha Shalash, the hunger striker Mohamed al-Qeiq’s wife, appealed to the Turkish President and Prime Minister to save her husband’s life as he enters his third month of hunger strike. During a press conference held on Sunday in al-Khalil, Fayha called on Turkish President Recep Tayyip Erdogan and Prime Minister Ahmet Davutoglu to intervene for saving her husband’s life before it is too late. She pointed out that her husband has been subjected, since his arrest without charge or trial, to severe torture and ill-treatment in Israeli jails. His health condition has entered a very critical stage after he stopped taking vitamins and only drinks water, she underlined. The 33-year-old Palestinian journalist Mohamed al-Qeiq is being shackled to his bed 24 hours a day in Afula hospital. Next to him stands two prison guards. Although it is unclear what he is being accused of, al-Qeiq was put under administrative detention and violently interrogated for weeks without being allowed to see a lawyer. 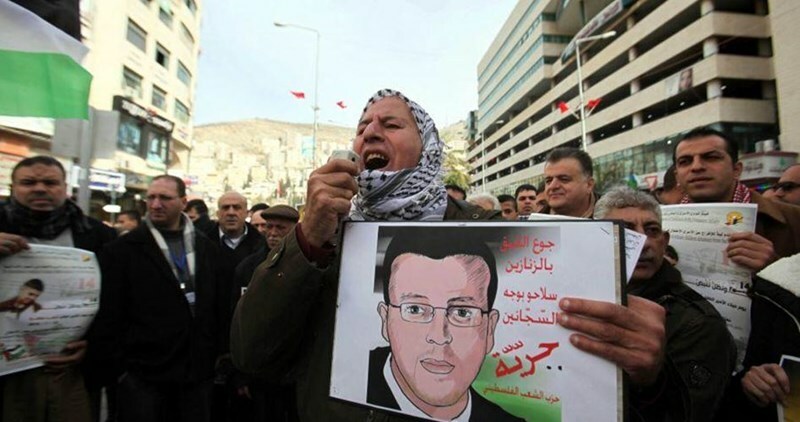 After realizing that his arrest was political, al-Qeiq declared a hunger strike. Sixty days have passed since he began refusing food, and according to those around him, his life is in danger. Alarm bells have been raised over the critical health status of Palestinian journalist Muhammad al-Qeiq after his hunger strike in Israeli jails has entered its 62nd day. Al-Qeiq’s family launched a cry for help, calling on the Palestinian masses in 1948 Occupied Palestine to speak up for al-Qeiq before it is too late. The detainee’s family further appealed to Arab MKs and activists, along with al-Qeiq’s fellow journalists and professionals, to urgently step in and rally outside the Afula hospital in support for the detainee. The family added that the detainee has only been drinking water and has gone through frequent blackouts. Journalist Mohamed al-Qeiq has been on hunger strike since November 25, 2015 in protest at being sentenced administratively, with neither charge nor trial, for six months. He was kidnapped from his family home in Ramallah on November 21, 2015 and had been subjected to exhausting investigation and torture rounds, which made him declare an open-ended hunger strike a few days later. The Palestinian Prisoners Society (PPS) has warned following several visits to al-Qeiq that the latter is going through a sharp health downturn and that he has been refusing to take vitamins and to undergo medical check-ups. Al-Qeiq was fed by force after he fainted and was transferred to the intensive care unit. Lawyer Jawad Boulos, who visited him on January 21, 2016, said the prisoner has entered a very critical stage and has gone through a remarkable weight loss and numbness in his hand. Prisoner al-Qeiq has lately asked to attend a hearing for an appeal filed on his behalf by the PPS on January 27, 2016 in protest at the administrative detention. Prisoner al-Qeiq vowed that he would keep up the hunger strike until he either restores his freedom or dies. Human rights groups and activists have raised alarm bells over the sharp exacerbation rocking the body of the detained Palestinian journalist Muhammad al-Qeiq, after his hunger strike in Israeli jails has entered its 60th day. A lawyer from the Palestinian Prisoners Society (PPS) said, following a visit he paid to the hunger-striker at the Afula hospital, that his health has entered a critical stage. She added that the detainee has only been drinking water and has gone through frequent blackouts. The Ad-Dameer institution spoke out against the harsh torture to which al-Qeiq was subjected to in Israeli occupation jails. According to the PPS, three other detainees have been starving in Israeli jails, including a Jordanian citizen. 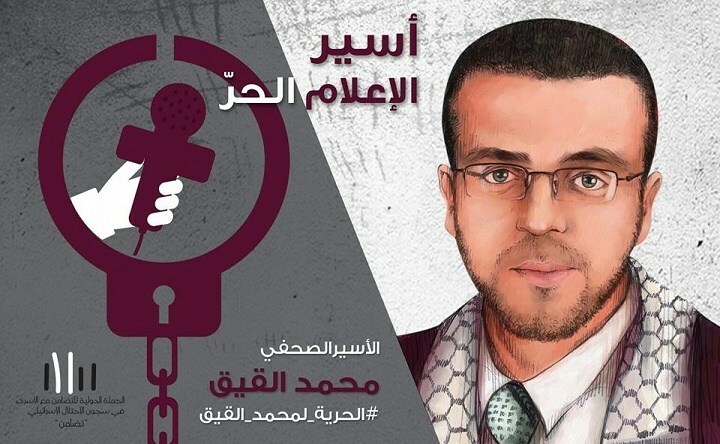 The imprisoned journalist Mohamed al-Qeiq, who entered his third month of indefinite hunger strike, renewed his determination to continue his protest strike until release or martyrdom. "I’m not a hostage, either freedom or martyrdom", al-Qeiq told his lawyer during his visit to Afula hospital on Sunday. The lawyer Jawad Boulus said that al-Qeiq’s life is in real danger as he may fall into coma at any time. Al-Qeiq's health condition is quite critical and entered a very serious stage after he stopped taking vitamins, Boulos underlined. Al-Qeiq is unable to speak, and is suffering from severe weakness, muscle pains, and constant dizziness, according to his lawyer. He pointed out that Israeli authorities did not show any willingness to reach an agreement regarding al-Qeiq’s demands. There is a total Israeli disregard to al-Qeiq’s hunger strike, the lawyer stressed. The family of the Palestinian hunger striking captive Mohammad al-Qeiq demanded the Palestinian, Arab and international institutions to work on the release of their son alive as he entered the sixtieth day of hunger strike. 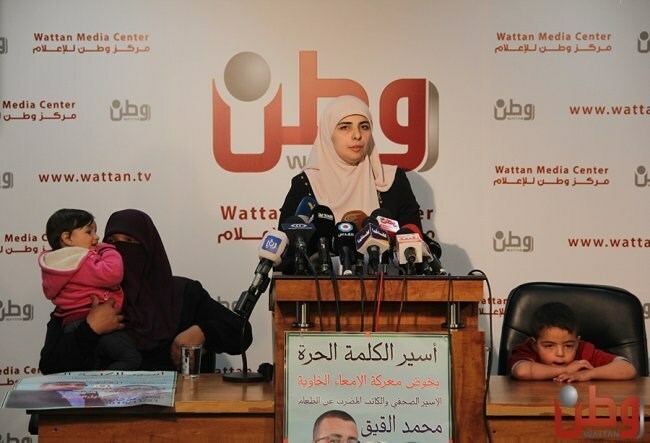 In a press conference in Ramallah on Saturday, the wife of detainee Qeiq, journalist Faiha Shalash, called on the Palestinian president Mahmoud Abbas and Prime Minister Rami al-Hamdallah along with human rights organizations to intervene and act immediately to pressure the Israeli authorities in order to release her husband who is in a very critical health condition. She also called on the Palestinian factions and syndicates especially the syndicates of journalists and lawyers and the committee of detainees as well as the Palestinian Prisoners Society to exert more efforts for that end. Shalash demanded the formation of a neutral, not an Israeli, medical committee to conduct the required medical examinations for captive Qeiq and to follow up on his condition as well as to inform his family with his news. In the same context, campaigns in solidarity with Qeiq were launched on Saturday under the theme “Free or Martyr”. Solidarity sit-ins were organized as well in Tulkarem and Ramallah cities demanding the Palestinian Authority to pressure Israel for his release. Captive Qeiq, 33, was arrested on November 21, 2015 and started an open hunger strike on November 25 in protest against his administrative detention with no charge or trial. He refuses to take supplements or undergo medical examinations. 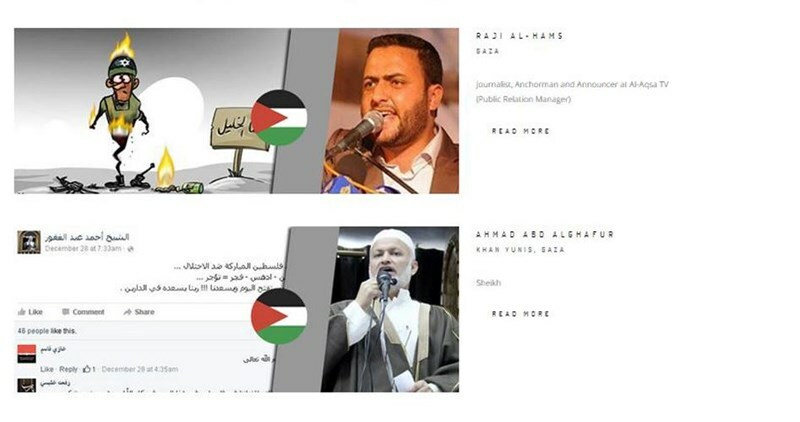 A European website has posted on its pages names of Palestinian journalists, bloggers and religious figures and accused them of inciting against the Israeli occupation state. The European institute against incitement posted on its website pictures and identities of 22 Palestinians, including 10 journalist and bloggers, and described them as instigators because of their involvement in exposing Israeli crimes and stating positions in support of the Palestinian resistance. The Palestinian Journalists' Syndicate expressed its concern over the European institute's incitement against Palestinian journalists. "We are deeply concerned for what has come in the website, especially against well-known journalists and members of the syndicate working for renowned Palestinian, Arab and foreign media agencies and outlets," the syndicate stated in a press release. The syndicate considered the website's incitement against journalists "incitement and permission to kill and assault journalists." It stressed that such incitement against journalists put the website and its administration in the circle of suspicion in terms of their affiliation and goals. For its part, the Palestinian information ministry condemned the website's accusations against Palestinians as "a blind bias for Israel's terrorism." "Publishing the identities of 22 Palestinians, including 10 journalists, by the institute's website has reflected a pathological behavior defending the executioner that practices all forms of murder and aggression," the ministry stated. The ministry affirmed it would take all legal and technical steps against the people in charge of the website. Hundreds of Palestinians demonstrated after Friday prayers in al-Aqsa Mosque calling for the immediate release of Mohamed al-Qeiq who has been on hunger strike for 59 days in protest against his administrative detention. The participants raised photos of al-Qeiq and slain Jerusalemites whose bodies continue to be held by Israeli authorities. A popular march was also organized in al-Bireh city in Ramallah in support of al-Qeiq’s hunger strike. A similar solidarity march was organized by al-Qeiq’s family in al-Khalil amid the participation of national and Islamic forces in addition to Palestinian MPs. During the march, the MP Nizar Ramadan called for forming an international committee to check on the hunger striker al-Qeiq’s health condition. He also called for forming a human rights committee for the defense of al-Qeiq. 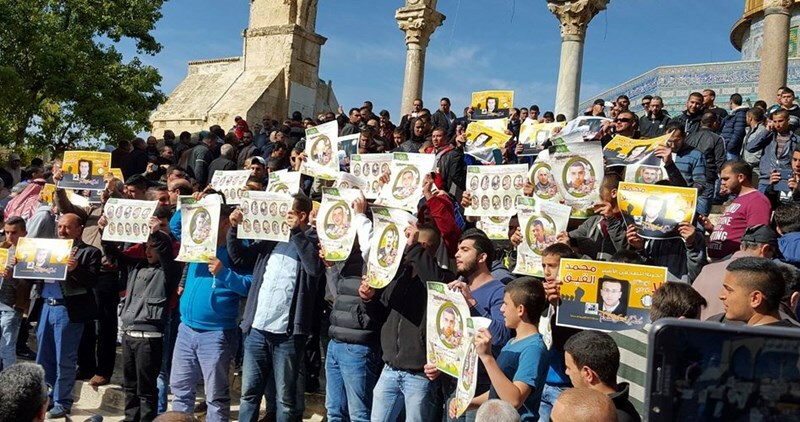 Similar marches were scheduled to kick off on Saturday in Umm al-Fahm, Qalanswa, Araba, and Kafer Qana within the Green Line in solidarity with the two hunger strikers Mohamed al-Qeiq and Abdulallah Jaber. Meanwhile, Palestinian journalists declared a solidarity day with their colleague Mohamed al-Qeiq’s protest steps in Israeli jails. The journalists called for covering and shedding more light on al-Qeiq’s hunger strike in all media outlets. Al-Qeiq enters his 59th day on hunger strike after being subjected to severe interrogation for 25 consecutive days. He gained widespread solidarity from his fellow journalists and human rights organizations working for his immediate and unconditional release. The Palestinian journalist captive Mohammad al-Qeiq, who has been on hunger strike for 58 days in Israeli jails, declared that he is determined to continue his hunger strike until his freedom or martyrdom. Lawyer Ashraf Abu Sneineh revealed that the Israeli Supreme Court approved on Thursday advancing his court hearing date to January, 27 instead of February 25 due to the severe critical deterioration of his health condition. Head of Detainees and Ex-detainees Committee Issa Qaraqe opined that the Israeli intelligence apparatus has a tendency of revenge against captive Qeiq. He said, in a statement, that Israel deals with detainee Qeiq as if he constitutes a threat to Israeli security. Qaraqe held the Israeli government responsible in full for the worsening of his health condition. The Arab Organization for Human Rights in Britain called on the UN Secretary-General Ban Ki-moon to pressure the Israeli authorities to end the policy of administrative detention with no trial or charge. Lawyer Jawad Boulus, head of the legal unit of Palestinian Prisoners Society, said on Thursday that prisoner Qeiq has entered a serious stage of health condition. He has become too exhausted and weak due to his ongoing hunger strike. The hunger striking detainee, Qeiq, sent a thanking letter to all of those who supported him especially his colleagues the journalists. Captive Qeiq, 33, was arrested on November 21, 2015, and was held under administrative detention for six months without charge or trial. He is married and and has two children. A group of Turkish and Arab journalists and media professionals gathered on Thursday evening in the Taksim Square, in Istanbul, in solidarity with the Palestinian hunger-striking detainee Muhammad al-Qeiq, starving for 58 days running in Israeli jails. The rally-goers expressed, in a statement written in the Arabic and Turkish languages, their solidarity with journalist al-Qeiq, who has been on an open-ended hunger-strike in protest at being held administratively, with neither charge nor trial, in Israeli occupation jails. The statement spoke up for al-Qeiq’s right to free press and free speech as already guaranteed by international laws and treaties. The journalists urged all humanitarian institutions, governments, and activists to immediately step in and work on releasing al-Qeiq. “Any Palestinian journalist is very like to be subjected to what al-Qeiq has been subjected to just by doing his/her job—disclosing Israeli crimes and violations against the Palestinian people,” the statement read. “For those reasons, we have to support the detainee until he restores his freedom and work on bringing Israeli policies of administrative detention to a halt,” it added. A letter by al-Qeiq’s wife, which was delivered during the vigil by journalist Majduleen Hassouna, also appealed to the Turkish people and government to work on releasing her husband before it is too late. A lawyer raised alarm bells over the sharp exacerbation rocking the body of the Palestinian detainee Muhammad al-Qeiq, after his hunger-strike in Israeli jails has entered its 57th day. A PIC news reporter quoted Al-Qeiq’s family as stating that lawyer Abu Esneineh updated them, following a visit he paid to the hunger-striker, that the latter has lost 30 kg of his overall weight and suffers severe headaches, along with a high fever and numbness in his hands. Abu Esneineh said al-Qeiq has been firmly declining all attempts to force-feed him or provide him with medical treatment against his will. Meanwhile, head of the legal unit at the Palestinian Prisoners Society (PPS), Jawad Boulos, spoke out against the apathy maintained by the Israeli prison service vis-à-vis al-Qeiq’s critical health condition. According to Boulos, the fact that the secretary of the Israeli Supreme Court set up February 25 as the date for a hearing of a petition filed by the PPS on behalf of al-Qeiq is a proof of Israel’s dragging of its feet and disregard for the detainee’s agony. Head of the legal unit of Palestinian Prisoners Society, Jawad Boulus, said that Israeli authorities are careless about the critical health condition of captive Mohammad al-Qeiq who has been on hunger strike for 57 days in protest against administrative detention. In a statement on Wednesday, lawyer Boulus slammed the decision of the Israeli Supreme Court of appointing February, 25 as the date of the appeal hearing for the seriousness of Qeiq’s health condition. Especially, when a sudden death has become a probability, according to doctors. Boulus pointed out that he asked the court to assign an earlier appointment for the appeal hearing. In the same context, dozens of lawyers and pressmen participated, on Wednesday, in a sit-in in solidarity with detainee Qeiq in front of al-Khalil court in the southern West Bank. The PIC reporter said that the lawyer syndicate in al-Khalil decided earlier on Wednesday to suspend work in courts at 11:00 a.m. and to gather before the court's building in solidarity with hunger striking prisoner. The National Committee in Support of Palestinian Prisoners organized in coordination with the Palestinian network for children's rights a solidarity vigil in Nablus in support of the journalist hunger striker Mohamed al-Qeiq and the imprisoned child Ahmed Manasrah. The participants held photos of the two prisoners and banners calling for their immediate release. The vigil came in protest at Israeli incessant violations against Palestinian children’s rights and against Israel’s systematic policy to gag journalists, head of the PA factional coordination committee Mohammed Dweikat said. 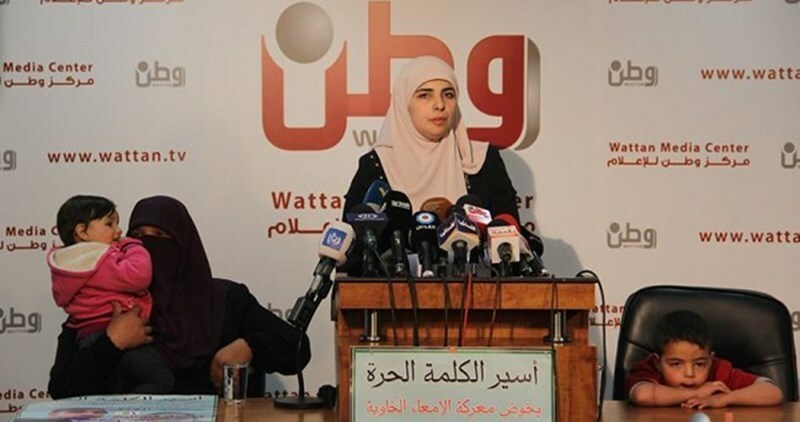 Dweikat called for putting the prisoners’ issue on the PA’s top priorities and to increase popular support for the prisoners’ demands. 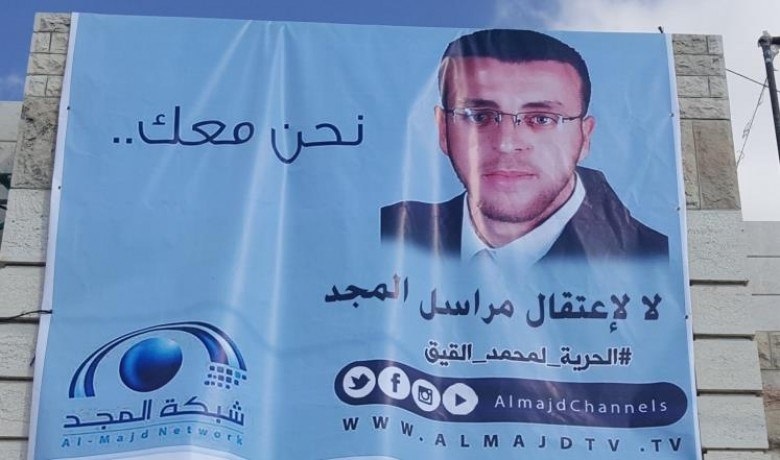 Similar vigils and marches are scheduled to be organized on Friday in Ramallah and al-Khalil in solidarity with Mohamed al-Qeiq who has been on hunger striker for 59 days. Popular marches are also scheduled to kick off in Umm al-Fahm, Qalanswa, Araba, and Kafer Qana within the Green Line in solidarity with the two hunger strikers Mohamed al-Qeiq and Abdulallah Jaber .